This is DroneShield's DroneGun, a 13-pound rifle that can jam the GPS and Global Navigation Satellite System (GLONASS) signals used to operate a drone from as far as 1.2 miles. For reference, that's further than two footballs fields. As a matter of fact, that's further than 15.6 more football fields than two football fields. I'm great at making clear and concise references. Like other similar guns (previously: this one), the gun doesn't destroy the drone the way the missile launcher I plan to use will, instead it either forces the drone to land, or return to its starting location, which can be used to track down its operator. What you do to its operator once you find them is up to you, but I suggest starting slow with some strong words and fist waving. Remember: you can always release the hornets later, but it's almost impossible to get them back in the jar once you do. Thanks to Mikel, who agrees the easiest way to disable a drone is use your weather controlling superpowers to smack it with a bolt of lightning. Before you get too excited and order one of these, it is illegal to use jamming devices in the US, as well as a federal violation to interfere with any aircraft. Drones are aircraft according to the NTSB and the FAA. Now how about a demo against a drone not purchased at Radio Shack for $40. Do you have to keep firing the whole time while controlling its position? 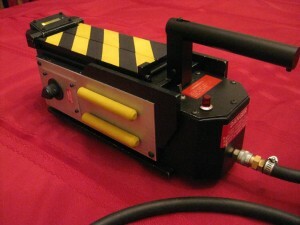 Cuz if so... dude... you guys.... this is how proton packs work! We can be real live Ghost Busters! Right?? Now we just need a Ghost Trap thingy big enough to hold drones. I like the idea of being able to defend one's privacy but at this distance it's likely to be used for vandalism. Will it work on military swarm drones with built in handguns? I also wonder if the local pawn shop will take drones. The control device might even pay for itself! All drones over a certain ridiculously small size have FAA registrations. So without proper FAA clearance bringing down a drone would be a federal crime. Granted this particular thing gives you some degree of plausible deniability if you use it unlawfully. Unlike other solutions like say a trained drone hunting eagle or anti-drone net drones or net missiles, all of which exist and have been tested.